Full marks here for enterprising and imaginative programming. All these works, two receiving their premier recordings, are played with imaginative verve, sensitivity and technical accomplishment by Maria Marchant who is a passionate advocate of British music. Britten’s Holiday Diary is a very early work. I would hesitate to accuse the composer of ‘mickey-mousing’ - the trade term covering an almost literal musical depiction of on-screen action but Britten’s very evocative Holiday Diary music (not film music I hasten to add, his work for the cinema would evolve later) comes very close. The opening movement Early ‘Morning Bathe’ makes for a listener’s involuntary Brr as they imagine the swimmer first entering chilly waters and one has a sneaking suspicion, from the rhythmic thrust, that the swimmer is doing the breast stroke. ‘Sailing’ is quite entrancing. It begins as a happy carefree experience in serene, still waters and there is a haunting nostalgic feel to the music; but slightly choppy waters are encountered and one imagines the sailors having fun splashing around and the whole experience is rounded off with a return to port through, perhaps, a golden sunset. ‘Fun-fair’ is a brief joyous crowd scene enjoying all the fun of the fair. Britten’s Night is not peaceful. This is an ambiguous night ride through disturbed sleep and discordant memories. Ronald Stevenson’s Peter Grimes Fantasy, admired by Britten himself, is a tour de force of dramatic and highly evocative piano writing. Stevenson described the work as a fugue on two subjects, the first the rise of Peter Grimes from bass to treble and the second subject that of the fall of Grimes from treble to bass. The storm music is adroitly woven into the work’s dynamic climax. John Ireland composed his Ballad of London Nights soon after Britten became one of his pupils. Regarded as a minor masterpiece of British impressionism, it has a grand romantically rhapsodic sweep and I cannot help but admire it in the same sort of context as Delius’s Paris. It shares the same glitter and glamour of the night spots but it also draws back to survey the quieter, peaceful areas of the City with maybe a touch of nostalgic regret? 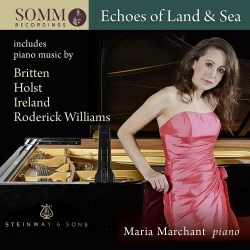 I was impressed with Roderick Williams’ free piano transcription of Ireland’s Sea Fever: salty, breezy strongly flowing and vivaciously original. That fine baritone, Roderick Williams is also a composer and Maria Marchant commissioned him to write Goodwood by the Sea which she premiered at the Shipley Arts festival in 2016. Of the work, Maria has written, “The work effectively simulates the ebb and flow of waves through an unfolding ostinato of a fifth, bitonality and foam-like ascending flourishes”. She most definitely brings this tremendously evocative music to life on this album and it certainly deserves to become a standard British solo piano repertory item. For me it is the standout item on this album. Leighton’s Six Studies are based on a four-note motif cell. Growth and development (chordal and contrapuntal) impress. The six movements are: 1) Adagio molto with strong material both mordant and determined; 2) Allegro molto e secco, molto ritmico – that is mercurial and skittish and rhythmically eccentric; 3) Adagio molto, misterioso ma molto espressivo which kind of describes the music but I was also very much reminded of Jocelyn Pook’s music for the Kubrick film, Eyes Wide Shut. 4) Allegro leggiero e capriccioso – presto music at the gallop that is jaunty and playful 5) Allegro molto, nervosa – it is anxious all right: black and mysterious, is murder afoot? 6) Presto con bravura – a rounding off, as marked, a high-spirited jazzy, syncopated conclusion. Gustav Holst’s solo piano music written between 1924 and 1932 has been shamefully neglected as evidenced here. The first in the line-up is his impressive ‘Toccata’, a genial rustic-flavoured creation. The following three pieces, based on Northumbrian folk-tunes also share this rustic charm: ‘Christmas Day in the Morning’ is a jolly celebration, ‘O! I hae seen the Roses Blaw’ is an innocent-like florid country tune and so too is the following piece, ‘The Shoemaker’. Holst’s lovely sylvan ‘Nocturne’ haunts – it has a lively dance episode at its centre. The syncopated ‘Jig’ might evoke childhood memories of the playground? Finally the programme is rounded off with Vally Lasker’s piano transcription of Holst’s Brook Green Suite. The work was created for the girls of St Paul’s School in Brook Green, London. Lasker’s transcription is faithful to the spirit of the work and works very well as a solo piano piece. It has an innocent child-like appeal but with a distinctly feminine grace that is immediately apparent in the Prelude. The following ‘Air’ is romantically wistful with a mild hint of regret while the concluding ‘Dance’ is jolly, bracing and akin to folk-music.